The one in which we tell about the name and musical direction of Living Creatures. I have been a “professional worship leader” at CrossPoint for the past ten years, but I have been leading music in church since I was fourteen years old. This year marks thirty-six years of music ministry. Even when I was touring and recording with Atomic Opera full-time I volunteered to help with the music at whatever church I was attending. For a couple years I played with Kemper Crabb at St John the Divine’s contemporary service. I like to name things, and while I was in the band we referred to the band as “Kemper Crabb and Four Living Creatures.” This was particularly clever because there was usually more than four of us. 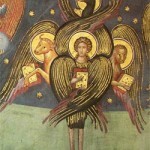 It was a reference to the Four Living Creatures who are mentioned in Revelation and Ezekiel. They are a class of heavenly beings who surround and uphold the throne of God as He is being worshiped and praised by all of creation. 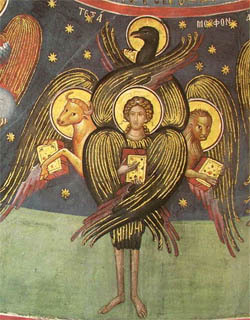 They are alert and knowledgeable, and their description is fantastic; the head of a lion, an eagle, a man and a bull, they have wings, and eyes all over in front and behind. In my way of thinking, they are like worship leaders. They surround God with worship and praise, and look strange while doing so; obviously some kind of freak musicians. I had been the music director at CrossPoint for about seven years when I started thinking about recording the songs I had written since leading this ministry. I tried to think of a name for the project that I liked better than Living Creatures, but I kept coming back to it. I finally gave up and called Kemper. I asked if he was still using the name Living Creatures, and he said he wasn’t. He said I was free to use the name, especially since it was my idea in the first place. Kemper rocks, in case you don’t know. The Musical Direction of the Living Creatures Project. I believe sacred music should be indigenous to the congregation; the music used in worship should reflect the cultural musical language of the people in the congregation. One way to figure out a congregation’s musical culture is to walk into successful shops and restaurants near the church. For example, if you were to visit the many restaurants, clubs, grocery stores, and retail shops within a five mile radius of CrossPoint Church you would hear a fairly limited scope of musical directions. There would be a lot of classic rock, a lot of pop, a little country and very little else. This is the indigenous musical culture of our general population. It is also the musical language I am most familiar with. I grew up listening to what is now considered classic rock, and I have stayed current with modern rock and pop along the way. The music of CrossPoint reflects this leaning toward classic rock, blues based, pop music. When I listen to the entire catalogue of my favorite artists who have been around for a long time, I always think the albums they recorded in the 70s sound the best. I like instruments to sound like they would sound if I was in the room with them. I am not a fan of bright, obvious reverb and a lot of the digital production that took over in the 80s, nor am I a fan of the “brick wall” smashed dynamics that marks most of the recordings from the 90s and current. I wanted the Living Creatures Project to sound like it was recorded, mixed and mastered in 1978. My good friend Alan Doss is also a huge fan of old-school, analogue recordings. He has one of the largest vinyl LP collections I have ever seen and a perfectly balanced and tuned system to play them. Listening to records at his studio is like having warm oil poured into your soul. 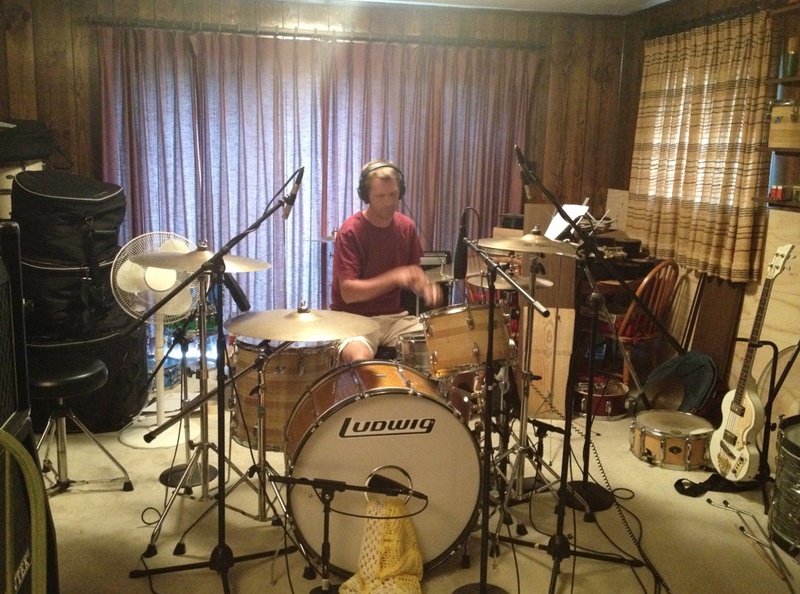 Alan is a wonderful musician, and he has the ears and the skill to arrange and record music on a world class level. 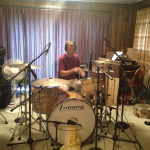 He was the drummer and producer for the Galactic Cowboys and I have been playing music and recording with him since we were going to school in Springfield Missouri nearly thirty years ago. I called Alan and told him what I wanted to do, and asked if he would be interested in helping me. I wanted to record the songs I had written for CrossPoint and make it sound like our favorite albums. I wanted to use vintage amps, vintage drums, old mic-pres, tube microphones, Fender Rhodes, Hammond Leslie organ, mellotron strings, and make the whole thing sound like we were fourteen years old sitting in our bedrooms wearing headphones. If you are curious what it actually sounds like, you can find it on iTunes, Google Play, Amazon or CDBaby. FIRST ARTICLE IN THIS SERIES. « 1. Behind The Living Creatures Project	» What is the best track on my albums? 5 Question Poll for True Fans.